There is much I don't remember, and there were no witnesses. I got on a green horse, but I don't know what happened next. Obviously something scared the mare. Hoofprints indicate she bucked and ran away. I think I may have gotten a foot caught in the stirrup. The ground was muddy and there were two impressions that probably were made by the helmet. It's also possible I was kicked in the head or stepped on. I lost consciousness for 30-60 minutes. 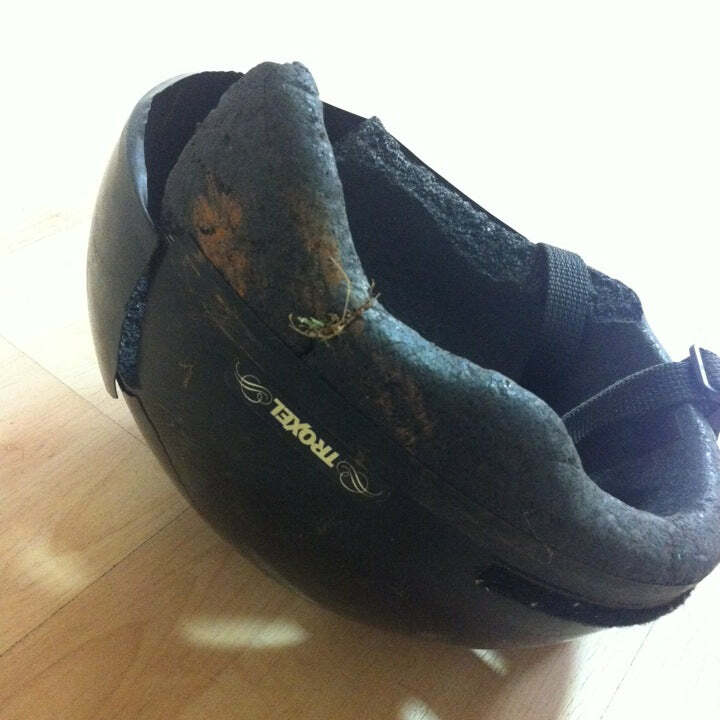 When I came to the helmet was on the ground still buckled. I went to the ER by ambulance. I was diagnosed with a concussion. I had a lot of pain in my left shoulder, left ribs and right thigh, but no broken bones. I went home the same day. Except for sore ribs (improving) and a very impressive bruise on my leg, there seems to be no lasting damage. And the mare seems completely unaffected. Have you ever been involved in an equestrian accident? Please share your story with us, and we'll post in the Headsmart Testimonials to help promote rider safety. Be sure to include a photo! My head hit the ground first.....then my back.